In its earliest days, the concept of hospice was rooted in the centuries-old idea of offering a place of shelter and rest, or “hospitality” to weary and sick travelers on a long journey. In 1967, Dame Cicely Saunders at St. Christopher’s Hospice in London first used the term “hospice” to describe specialized care for dying patients. Today, hospice care providers humane and compassionate care for people in the last phases of incurable disease so that they may live as fully and comfortably as possible. Hospice is a philosophy of care. The hospice philosophy or viewpoint accepts death as the final stage of life. The goal of hospice is to help patients live their days as alert and pain free as possible. Hospice care tries to manage symptoms so that a person’s last days may be spent with dignity and quality, surrounded by their loved ones. Hospice affirms life and neither hastens nor postpones death. Hospice care treats the person rather than the disease; it focuses on quality rather than length of life. Hospice care is family-centered and it includes the patient and family in making decisions. This care is planned to cover 24 hours a day, 7 days a week. Hospice care is used when you can no longer be helped by curative treatment and you are expected to live about 6 months or less if the illness runs its usual course. Hospice gives you palliative care, which is treatment to help relieve disease related symptoms, but not cure the disease; its main purpose is to improve your quality of life. You, your family and your doctor decide together when hospice care should begin. One of the problems with hospice is that it is often not started soon enough. Sometimes the doctor, patient or family member will resist hospice because he or she thinks it means you’re “giving up” or that there’s no hope. This is not true. If you get better or the cancer goes into remission, you can be taken out of the hospice program and go into active cancer treatment. You can go back to hospice care later, if needed. But the hope that hospice brings is the hope of a quality life, making the best of each day during the last stages of advanced illness. In most cases, an interdisciplinary health care team manages hospice care. This means that many interacting disciplines work together. Doctors, nurses, social workers, counselors, home health aides, clergy, therapists and trained volunteers care for you and your family. Each of these people offers support based on their special areas of expertise. Together, they give you and your loved ones complete palliative care aimed at relieving symptoms and giving social, emotional and spiritual support. The goal of pain and symptom control is to help you be comfortable while allowing to stay in control of and enjoy your life. This means that discomfort, pain and side effects are managed to make sure that you are as free of pain and symptoms as possible, yet still alert enough to enjoy the people around you and make important decisions. Since people differ in their spiritual needs and religious beliefs, spiritual care is set up to meet your specific needs. It may include helping you look at what death means to you, helping you say good-bye or helping with a certain religious ceremony or ritual. Although hospice care can be centered in your home, you may need to be admitted to a hospital, extended-care facility or a hospice inpatient facility. The hospice can arrange for inpatient care and will stay involved in your care and with your family. You can go back to in-home care when you and your family are ready. While you are in hospice, your family and caregivers may need some time away. Hospice service may offer them a break through respite care, which is often offered in up to 5-day periods. During this time you will be cared for either in the hospice facility or in beds that are set-aside for this in nursing homes or hospitals. Families can plan a mini-vacation, go to special events or simply get much needed rest at home while you are cared for in an inpatient setting. Regularly scheduled family conferences, often led by the hospice nurse or social worker, keep family members informed about your condition and what to expect. Family conferences also give you all a chance to share feelings, talk about what to expect and what is needed, and learn about death and the process of dying. Family members can find great support and stress relief through family conferences. Daily conferences may also be held informally as the nurse or nursing assistant talks with you and your caregivers during their routine visits. Bereavement is the time of mourning after a loss. The hospice care team works with surviving loved ones to help them through the grieving process. A trained volunteer, clergy member or professional counselor provides support to survivors through visits, phone calls, and/or letter contact as well as through support groups. The hospice team can refer family members and care-giving friends to other medical or professional care if needed. Bereavement services are often provided for about a year after the patient’s death. Hospice care staff members are kind and caring. They communicate well, are good listeners and are interested in working with families who are coping with a life-threatening illness. They are usually specially trained in the unique issues surrounding death and dying. Yet, because the work can be emotionally draining, it is very important that support available to help the staff with their own grief and stress. Ongoing education about they dying process is also an important part of staff support. The interdisciplinary team coordinates and supervises all care 7 days a week, 24 hours a day. This team is responsible for making sure that all involved services share information. This may include the inpatient facility, the home care agency, the doctor and other community professionals, such as pharmacists, clergy and funeral directors. You and your caregivers are encouraged to conduct your hospice team if you are having a problem, any time of the day or night. There is always someone to call to help you with whatever may arise. Hospice care assures you and your family that you are not alone and help can be reached at any time. Hospice care is defined not only by the services and care provided, but also by the setting in which these services are delivered. Hospice care may be provided in your home or in a special facility. Most cancer patients choose to get hospice care at home. In fact, more than 90% of the hospice services provided in this country are based in patients’ homes. Before making a decision about the type of program that is best for you and your family, it is important to know all your options and what each requires. Your doctor, hospital social worker or discharge planner can be very helpful in deciding which program is best for you and your family. Many, if not all, of the home health agencies in your community, as well as independently owned hospice programs, will offer home hospice services. Although a nurse, doctor and other professionals staff the home hospice program, the primary caregiver is the key team member. The primary caregiver is usually a family member or friend who is responsible for around-the-clock supervision of the patient. The person is with the patient most of the time and is trained by the nurse to provide much of the hands-on care. It is important to know that home hospice may require that someone be home with you at all times. This may be a problem if you live alone or if your partner or adult children have full-time jobs. But creative scheduling and good team work among your family and give needed care and services. Care begins when you are admitted to the hospice program, which generally means that a hospice team member visits the home to learn about you and your needs. Return visits are set up so that your needs can be re-evaluated regularly. To handle around-the-clock patient needs or crises, home hospice programs have an on-call nurse who answers phone calls day and night, makes home visits or sends the team member you may need between scheduled visits. Medicare-certified hospices must provide nursing, pharmacy and doctor services around the clock. Hospitals that treat seriously ill patients often have a hospice program. This arrangement allows patients and their families’ easy access to support services and health care professionals. Some hospitals have a special hospice unit, while others us a hospice team of caregivers who visit patients with advanced disease on any nursing unit. In other hospitals, the staff on the patient’s unit will act as the hospice team. Many nursing homes and other long-tem care facilities have small hospice units. They may have a specialty trained nursing staff to care for hospices to provide care. This can be a good option for patients who want hospice care but do not have primary caregivers to take care of them at home. Many communities have freestanding, independently owned hospices that feature inpatient care buildings as well as home care services. As with long-term care facility hospice programs, the freestanding hospice can benefit who do not have primary caregivers available at home. Home hospice care usually costs less than care in hospitals, nursing homes or other institutional settings. This is because less high cost technology is used and family and friends provide most of the care at home. Medicare, Medicaid in most states, the Department of Veterans Affairs, most private insurance plans, HMOs and other managed care organizations pay for hospice care. Also, community contributions, memorial donations and foundations gifts allow many hospices to give free services to patients who can’t afford payment. Some programs charge patients according to their ability to pay. To get payment from Medicare, the agency must be approved by Medicare to provide hospice services. To qualify for the Medicare hospice benefit, a doctor and the hospice medical director (also a doctor) must certify that the patient has less than 6 months to live if the disease runs its normal course. The doctor must re-certify that the patient at the beginning of each benefit period (2 periods of 90 days each, then an unlimited number of 60-day periods. The patient signs a statement that says he or she understands the nature of the illness and of hospice care and that he or she wants to be admitted to hospice. By signing the statement, the patient declines Medicare Part A and instead chooses the Medicare hospice benefit for all care related to his or her cancer. The patient can still receive Medicare benefits for other illnesses. A family member may sign the statement if the patient is unable to do so. In 1986, laws were passed to allow the states to develop coverage for hospice programs. Most states have a Medicaid hospice benefit, which is patterned after the Medicare hospice benefit. Most private insurance companies include hospice care as a benefit. Be sure to ask about your insurance coverage, not only for hospice, but also for home care. If insurance coverage is not available or is not enough to cover all costs, the patient and the family can hire hospice providers and pay for services out of pocket. Some hospices provide services without charge if a patient has limited or no financial resources. Your doctor or hospital discharge planner can help you find hospices in your area. Hospice care providers also are listed in the phone book. Your community may have information and referral services available through your American Cancer Society and Agency on Aging, a local United Way chapter, the Visiting Nurse Association or your place of worship. You may contact your state’s hospice organization or its department of health or social services to get a list of licensed agencies. The state health department oversees certification of hospice services to get a list of licensed agencies. The state health department oversees certification of hospice services. Certification makes them able to get funding from Medicare and, in some states, also from Medicaid. Check the blue pages of your phone book for other resources in your area. What questions should I ask about hospice care? There are a number of things you might want to ask about when deciding on a hospice program. We will review some of them here. Is the agency accredited (certified and licensed) by a nationally recognized group, such as the Joint Commission? The Joint Commission is and independent, not-for profit organization that evaluates and accredits health care organizations and programs. It is an important resource in selecting quality health care services. Is this hospice program certified by Medicare? Medicare-certified programs have to meet at least minimum requirements for patient care and management. If your state requires it, is the program licensed? Does the agency have written statements outlining services, eligibility rules, costs and payment procedures, employee job descriptions and malpractice and liability insurance? Ask them to send you any brochures or other available information about their services. How many years has the agency been serving your community? Can the agency give you references from professionals- such as a hospital or community social workers- who have used this agency? Ask for names and telephone numbers. A good agency will give you these if you ask them. Talk with these people about their experiences with the hospice. Also, check with the Better Business Bureau, your local Consumer Bureau or the State Attorney General’s office. How well does hospice work with each patient and family to apply policies or negotiate differences? If the hospice imposes conditions that do not feel comfortable, it may be a sign that it is not a good fit for your. If you are not sure weather you or your loved one qualifies for hospice- or weather you even want it- is the agency willing with you to help you talk through these concerns? Does the agency create a care plan for each new patient? Is the plan carefully and professionally developed with input from you and your family? Is the care plan written our and are copies given to everyone involved? Check to see if it lists specific duties, work hours/days and the name and telephone number of the supervisor in charge. Will the care plan be updated as your needs change? Ask if you can look at a sample care plan. Does the hospice require you to have a primary caregiver as a condition of admission? What responsibilities are expected of the primary caregiver? Will someone need to be with you at this time? What help can the hospice offer to organize and assist the family’s efforts? For example, can the hospice help you fill in around job schedules, travel plans or other responsibilities? If you live alone, what other options can the hospice suggest? Does a nurse, social worker or therapist come to you to talk about and evaluate the types of services you may need? Is this done in your home, rather than over the telephone? Does it highlight what you can do for yourself? Does it include input from your family doctor and/or other professionals already involved in your care? Are other members of your family included in this visit? Are there references on file for home care staff? Ask how many references the agency requires for each staff member who gives home care (2 or more should be required). Does the agency train, supervise and monitor its caregivers? Ask how often the agency sends a supervisor to the patient’s home to review the care being given to the patient. Ask weather the caregivers are licensed and bonded. Who do you call if you have questions or complaints? What is the procedure for resolving issues? How does the agency handle payment and billing? Get all financial arrangements- costs, payment procedures and billing- in writing. Read the agreement carefully before signing. Be sure to keep a copy. What resources does the agency provide to help you find financial assistance if it is needed? Are standard payment plan options available? Does the agency have a 24-hour telephone number you can all when you have questions? How does this hospice respond to calls? Does the telephone staff seem caring, patient and competent from the first contact, even if they need to return your call? Do they speak in plain, understandable language? What is the procedure for making and resolving complaints? How did the hospice respond when you first contacted them? How a hospice responds to your first call for help may be a good sign of the kind of care to expect. Does the agency have an emergency plan in place in case of a power failure or natural disaster? You can ask to see a copy of the plan. In case of an emergency, you need to know weather the agency can still deliver services at your home. How quickly the hospice start services? What are its geographic service boundaries? Does the hospice offer specialized services such as rehabilitation therapists, pharmacists, dietitians or family counselors when these could improve your comfort? If needed, does the hospice provide medical equipment or other items that might improve your quality of life? During your first visit be sure to talk about all of the treatments you are currently getting. If you want to continue these things you must make it clear to the hospice provider. Some hospices will not cover things like dialysis, total parenteral nutrition (TNP, or intravenous feedings), blood transfusions or certain drugs. But some hospices, most often the bigger ones, do offer open-access care which allows you to add hospice care to your current medical treatment. Still, this is not always an option. Find out how the hospice would handle your current treatments before committing to their services. You may also want to find out how the hospice would manage it if you should get a health problem that is curable, such as a urinary tract infection or pneumonia. Even though they cannot cure your cancer, you may be more comfortable if they are able to treat these smaller problems. What are the policies about inpatient care? Where is such care provided? What are the requirements for an inpatient admission? How long can the patient stay? What happens if the patient no longer needs inpatient care but cannot go home? 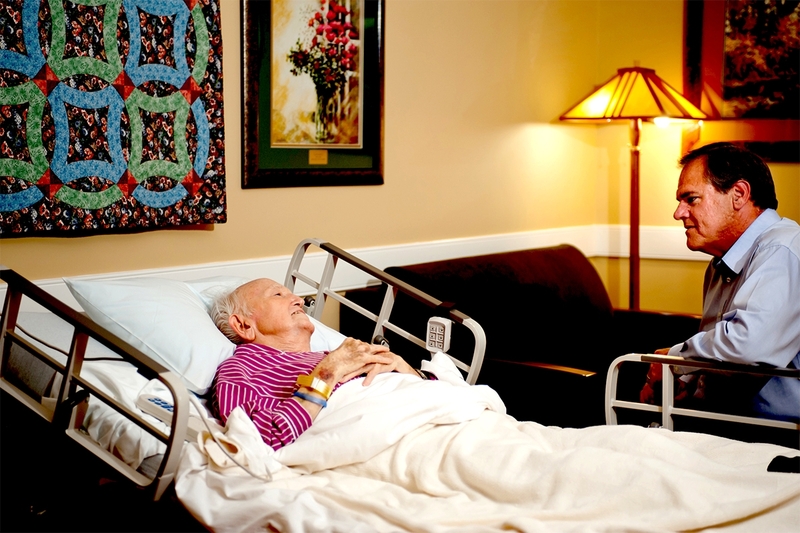 Can you tour the inpatient unit or residential facility? Which hospitals contract with the hospice for inpatient care? What kind of follow-up does the hospice provide for inpatients? Do nursing homes contract with the hospice? Does the hospice provide as much nursing; social work and aide care for each patient in the nursing home as it does in the home setting? Does the agency explain your rights and responsibilities as a patient? Ask to see a copy of the agency’s patient’s rights and responsibilities information. You and your loved ones are facing a sensitive and difficult time. Hospice care is a way to get the help you all may need. Please remember that there are also professional cancer information specialists who are ready to talk with you about your concerns. They are available 24 hours a day, 7 days per week at the National Cancer Information Center. You can speak to one of them by calling 1-800-227-2345.